Measured Voices features music and conversation with songwriters from around the Treasure Valley of SW Idaho and Eastern Oregon. Music and conversation from Nampa's Brandon Thomas of Brandon Thomas and the Nightjars. Get the complete episode description on the Measured Voices blog. The former member of Edison talks about his time in the band, his solo work, his move to Boise, and more. Get the complete rundown on the Measured Voices blog. Solo piano artist Michele McLaughlin talks about her music, her approach to songwriting, and more. Get more details on the Measured Voices blog. 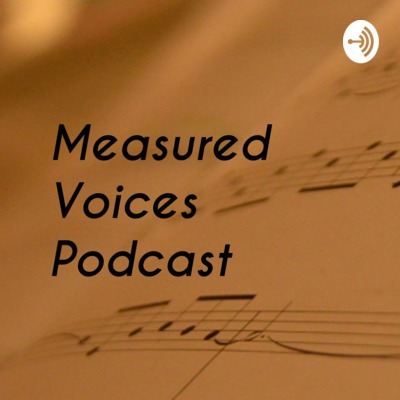 Get the complete episode description on the Measured Voices blog page. Episode 26 is here! A special from the road edition. As always, get the details about episode 26 from the Measured Voices blog. A sneak peek at episode 26, featuring Nashville band Credenda, formerly from Idaho. Learn more on the Measured Voices blog. A conversation with Nampa's music man, Timothy P. Swanson. Get the lowdown on this episode on our webpage. Founding members of Jonathan Warren and The Billy Goats. Get the complete show description on the Measured Voices blog. 60-second promo for my upcoming conversation with former Treasure Valley and current Nashville area band Credenda. Find the complete show description on the Measured Voices blog page. Get the full episode description, plus band links on the Measured Voices blog page. This time around, I sit down to talk with the former keyboard player for Prince, Gayle Chapman. Find the complete episode description at https://measured-voices.blogspot.com. Boise singer-songwriter Naomi Psalm sits down with me to talk about and share her music. Get the complete show description on the blog at https://measured-voices.blogspot.com/ and follow the podcast on Facebook and Twitter @MeasuredVoices. Conversation with Boise singer-songwriter Lee Penn Sky. Get the breakdown on our conversation at https://measured-voices.blogspot.com as well as the links to Lee's website and social media pages. A wild ride with Jesse and Lippu Niebolt of Logan's Heroes. Then, Jesse is joined by Zachary Breuer and Shawn Dirksen to talk about their band, Between Disasters. As always, https://measured-voices.blogspot.com is the place to go for complete show notes and pictures. He once won Star Search with his band, Moment of Silence. Now Tom Taylor is a solo artist, about to release his latest CD, Voodoo Moon. We talk about the Star Search experience, about how his music has changed over the years, about his upcoming release, and more. Complete show notes and links at https://measured-voices.blogspot.com. A conversation with pianist Lynn Tredeau on the eve of the release of her fifth album, Fellowship of Solitude. Complete show notes and links from the episode at https://measured-voices.blogspot.com. Complete show notes and links at https://measured-voices.blogspot.com. I sit down with New Age multi-instrumentalist Joseph L. Young to discuss his latest album, Every Moment. Along the way, quantum physics slips into the conversation. Boise singer-songwriter Fiona Luray talks about her love of musicals, her songwriting process, what she'd want with her on a desert island, and more. Plus, she shares three of her songs, including one from her upcoming album. Complete show notes at https://measured-voices.blogspot.com. Part one of a two-part conversation with Sean & Kyle Luster of Red Light Challenge. This is a remix of an earlier upload, attempting to correct some of the audio issues in the first version. In this episode, Sean & Kyle talk about where they got their name, about their use of deadlines, performing as a duo vs. performing with a band, and the benefits of studying business when it comes to music. They'll also perform their songs "I Wanna Give Back To You" and "You Got My Number."